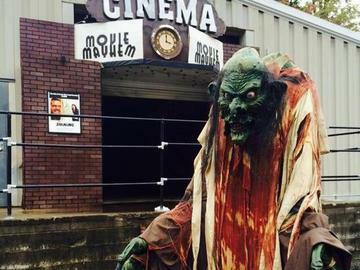 Fright Nights is Southern West Virginia's biggest and scariest haunted attraction! New scenes, characters, and scares planned for 2017! Appalachian Anarchy Haunted Trail: Meet new characters and see brand new scenes for 2017! Grab your friends and head out on a tour of Wild and Wicked West Virginia. They say witches have been gatherin' in these woods and the town folk don't like that too much. Be prepared as this adventure takes a terrifying wrong turn into the demented hollers of the hills. 3D Nightmare- Grab your 3D glasses and experience floating walls, moving floors, and terror around every corner. Watch out for 3D Pirates in 2017! Biohazard Laser Tag- Expanded for 2017, our interactive laser tag experience where you must fight mutated scientist and shut down the power plant before the radiation mutates you! Fright Nights strongly restricts weapons, firearms, drugs, and alcohol at the event. Persons under the influence of drugs and/or alcohol will be removed from the event without refund. Children under the age of 12 years are restricted from entering the attraction without a supervising adult.